" Welcome to Lavender Dreams ": Home Improvements! I've put together a lot of pretty mosaics in the years we've shared Mosaic Mondays! Let's see if I can at least find a pretty flower to start. Home Improvements...aaaahhhh...it brings a smile to my face! 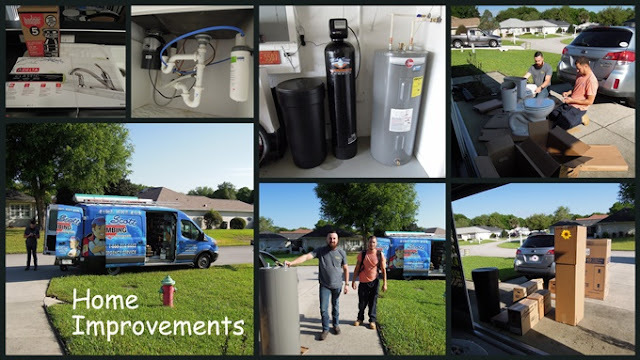 It was a LOT of WORK for the plumbing crew that came from Mike Scott Plumbing but they 'got it done'! They arrived at 9 am sharp and left at 7:30 pm and it was all complete! Are those toilets on my driveway? OH MY! What will the neighbors think! And once you start, you don't know when to quit! 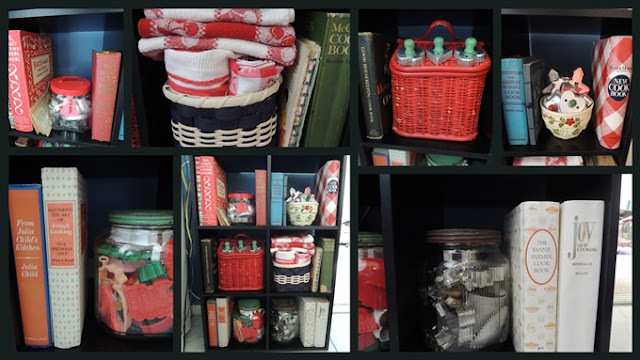 We bought a small bookcase for the corner of the kitchen and I filled it with old timey jars and baskets. Lots of old cookbooks and cookie cutters. I told Happyone that I had these old glass jars from my Grandmother and here they are! The top of one has Old Judge Coffee on it! I love these old jars! I'll be 'tweaking' this for awhile but at least I've got it close to the way I want it. Not sure about the tea towels and cloth napkins though! I may 'move' them! So what's new at your house this week? Or old? I love old things! Just not 'old' plumbing! hahaha! and Amaze me Monday HERE. I like your kitchen bookshelf...so much you can do to style it. I see lots of things that we share right down to the jars filled with cookie cutters. It is good to keep things updated. I’m sure that the neighbors will forgive you. Your new bookshelf with it's goodies looks great! New plumbing is exciting and very practical. I had to laugh at the mosaic. I'd LOVE to have old jars - you're lucky! New plumbing is necessary at times. It is good to have things updated, especially pipes. The new bookshelf looks nice and I like the old jars. Enjoy your day! Wishing you a great new week ahead! It's good to get plumbing done quickly and not have the mess underfoot for days. I like your cookbook corner. I even recognized some of your cookbooks. I wish I knew where my red plaid cookbook is packed. It's my go-to. Diane - you know those toilets in your driveway are only a problem if you leave them there! Love what you did with the bookcase - the red theme is a standout. Over the weekend we attended a charity event and won a lovely metal bucket full of herbs and gardening supplies - the herbs have added a nice touch of green to our kitchen window! Thanks for linking to Mosaic Monday and have a terrific Easter week! All finished in one day? Wow, they work fast. I would love to redo my bathroom it really needs it. Hi Diane, oh yes we do all need a good plumber from time to time. I just had the plumber come 3 times recently to get the job correct for a leak underneath my kitchen sink! The whole pipe was completely apart and we didn't even realize it and I'm so glad I caught that leak when I did! The third time was a charm and they got it right. It is a great idea to stay on top of things in the house. I hope you have a nice week and a Happy Easter. Over the weekend we had to put new wood around our raised garden beds and this year we are doing some work to our bathroom too. I hate spending money on plumbing but without it, what a mess! And I extra love the new shelves. They look cute as can be! when our children moved out, we "gutted" their bathroom and had it completely redone, it's gorgeous now. the guys started on monday, finished on friday and i was so impressed with their work ethic! home remodeling projects are not fun, i have a hard time with the disruption!! your shelves look cute!! i am not doing anything special or out of the ordinary. your april picture is pretty!!! How nice to enjoy new fixtures in your bathroom, Diane. Would you believe we have a bathroom that still has a green toilet? Our home was built in the 70's as you may have guessed! You are so right once we begin on a home improvement project it leads to another. Enjoy your changes. Love your shelves with all the fun things on it. It's a nice shelving unit! Nicely decorated. I'm hoping not to have plumbers here soon!!! Dearest Diane; Oh I LOVE your bookcase and collage. I wish to have a space in my TINY kitchen p-;) I The handsome looking plumbing crew must be so dexterous♧♧♧ You made me remember the time we went though these "Home Improvements" decades ago, Haha. Thank you so much for your sweet comments, Dear friend. Plumbing jobs... Yikes! God bless plumbers everywhere!! I like your new bookshelf! Very cute! Hi my sweet friend, I am back and I've missed you! I love your cute little bookcase and how you arranged it, it all looks great! I loved the previous post about the Rainbow area too....very pretty place and YAY! !---you got me a picture of an alligator!--what a nice looking one too. I love those wood boardwalks, we have alot of those here in South Carolina and we love walking on them. I think we may have walked a few in Florida as well. Hope your week has started out great and cant' wait to see where ya'll hike us to next!!! Happy MosaicMonday... Indeed plumbing is necessary. Diane, Nice to have plumbing issue handled. I did that in February and it feels good. It can create a mess if not handled. Love the small bookcase full of goodies. My favs are the old cookie cutters. Thanks for sharing and have a great week. Sylvia D.
Oh, I love that first picture of the flowers. They look like lace doilies all woven together. Wow, you organized your kitchen bookcase very nicely. You know, I have an old Betty Crocker cookbook that looks just like yours, and it's about 40 years old. Your jars are pretty and it lets you see all the goodies inside. Home Improvements are kind of a bother, but when completed, it makes us so very happy. Enjoy! I'm coveting those old glass jars! What a treasure! What's new here is my new Ninja blender. I picked it up yesterday at the post office, then got so tired, I just left it in the dining room and promptly forgot about it. Thanks for the reminder, I'll go and unpack it now. Love what you did with the bookcase. Well … new plumbing is necessary at times! I think the new bookshelf looks nice and I like the old jars. Hope you've had a good week so far - I can't believe that Easter is just around the corner! Love how you decorated your new shelf. The old time jars were a great idea. Congrats on getting that plumbing done in one day! Those plumbers would have got a nice cup of tea from me for all that hard work, good job!